This four bedroom, four full bath home has it all. There are many quality features throughout the 3535 square feet of enjoyable living space. 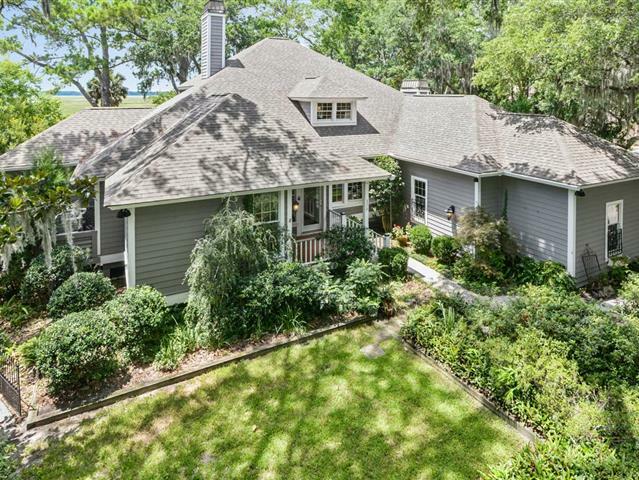 There are custom built-ins, gorgeous hardwood floors and plush carpet, high ceilings, and incredible marsh views with beautiful sunsets.This home is one-of-a-kind, in that it offers two master suites on the first floor. It is also includes some handicap accessible features like a chairlift to the second floor, handicap walk-in showers, and a walk-in closet in one of the master suites. There is a sitting area to the right of the front door, perfect for receiving guests. Then it opens into the Great Room, where the elegant fireplace is the main focal point. The dining room also enjoys a fireplace and bay window for memorable views.The Carolina Room is on the second floor and has expansive views of the low country landscape. It also overlooks the immaculate backyard, and picturesque Spanish moss covered trees.